Have you ever played the “Would You Rather Game”? It’s a great game to pass the time when you are traveling with antsy kids; that’s when I started playing it. For example, I would ask my kids, “Would you rather be stuck in this car for 2 hours or cleaning the garage?” Their answer would obviously be the easier of the two. When we look at this game as a Godly lesson, we can use the example of today’s scripture. 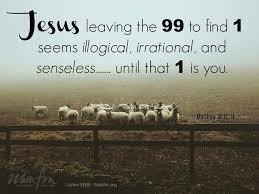 Would you rather seek and look for the one lost sheep or would you just stay with the 99 and forget about the one lost sheep? In Jesus’ parable, the shepherd made the right choice to seek the one lost sheep. I am sure it took a lot of extra effort and time but sometimes the obvious choice in life isn’t the easiest, biggest or most glamorous, but it is the right choice. In all things, whether big or small, pray about it. Talk to God about it before you make your choice unless you would rather make a mistake! Have a blessed day!